Having observed the success of fellow Middle East golfing powerhouses Dubai and Abu Dhabi, it seemed inevitable that Oman would follow suit. Now it’s a case of watch this space – it’s potential really is enormous and the Sultanate’s ambition obvious, without being blatant. There’s a concerted effort to boost international tourism and, as is so often the case, golf provides the perfect vehicle. The striking thing about Oman is its inherent natural beauty, something that really sets it apart from its more artificially-formed neighbours. The capital, Muscat, is a city on the ocean, but is framed by spectacular mountain ranges. The walled city is home to the Sultan of Oman’s Royal palace, which rubs shoulders alongside back street markets behind the famous Corniche road which runs along the picturesque harbour, where traditional Arab dhows bob in the water alongside cruise ships and huge private yachts. Things are slower here, more measured. It’s raw Arabia, and for all its growth and development there’s clearly no desire to become the new Dubai. It’s playing to its geographical strengths and very proud of a strong cultural history. 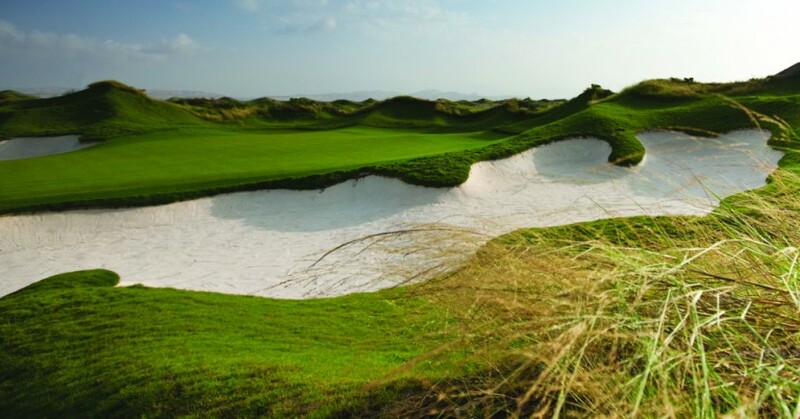 Golf was first played in Oman in the 1970s on sand courses, bit now it showcases three 18-hole grass layouts – Almouj Golf, Muscat Hills and Ghala Valley – with many more on the horizon. Interest has been gathering of late due to the recent hosting of the National Bank of Oman Golf Classic on the Challenge Tour at the Greg Norman-designed Almouj Golf, and there’s nothing like a professional tournament to raise profile. The feedback from the players was superb and I give it five years before we see Oman as part of the so-called ‘Desert Swing’ on the European Tour. Almouj Golf is part of The Wave, a prime residential and leisure destination with much to offer. The set-up is very professional, with general manager Simon Duffield having started out at Wentworth, and Mubarak Hill, the sales and marketing director, the former general manager at Ghala Valley. The Almouj course, which plays to over 7,300 yards off the back tees, is a demanding test presented in pristine condition. One thing that really impressed me was the landscaping – the grass and foliage were always perfectly manicured, giving an attentive feel even amid the extensive construction work. The quality of the courses was no exception. The par threes at Almouj are superb. Standing on the tee box at the second, the ideal shape is a little cut to an elevated green with the ocean just beyond – it’s a beautiful looking hole. In fact, the start will blow you away, a string of coastal holes providing a real links feel with views over the Arabian Sea. It reminded me a lot of Yas Links, something that Simon admitted they’d heard plenty of times before, but there are worse comparisons than to a Kyle Phillips design. I also loved the 14th, another fabulous short hole, this time with an island green which proved tough to hold with the wind blowing hard off the left – as is often the case on this exposed layout. I tackled Muscat Hills the day after Almouj, and it was an excellent juxtaposition. The coastal course compared to the inland layout, famous for its rolling hills and generous fairways. That’s without question one of its great appeal – you walk off having enjoyed your round and not feeling beaten up by the course. Although Ray Stoporth, the affable South African Director of Golf, tells me they are tightening the fairways, so I expect a tougher test on my next visit! The course is beautifully carved into the natural landscape, weaving its way through the wadi beds and ensuring a couple of daunting tee shots over gaping ravines. Making up the Sultanate’s golfing triumvirate is Ghala Valley, which is carved out of a valley, offering a contrasting experience to the other two venues. Ghala Valley was previously a sand course, and has only been converted to a grass during the last couple of years. Converting from sand to grass layout is no mean feat, and the course’s playability is testament to a job well done. In fact such a good job, that it was fit to be chosen as a host venue for a MENA Tour event at the end of last year, and will do so again in October this year. It’s a tough test, featuring narrow fairways and some demanding tee shots, notably on the par-five fourth hole and the eighth, where the fairway is largely obscured by a tree just 80 yards or so from the markers. Oman has many things in its favour. Obviously the weather is a huge plus – a gloriously dry mid-20’s in January – and there are lots of other leisure activities to enjoy. Those who like a bit of adventure should book a weekend break staying in a Bedouin tent camp in the Wahiba Sands, where activities include 4×4 excursions, quad-biking, dune-bashing, camel riding and sleeping under the stars. Diving is also a popular holiday activity, with numerous schools operating trips out to wrecks in the Arabian Sea, while hiking and mountain biking are very popular and no, you won’t find skiing here anytime soon! From a golfing perspective the offering is already excellent, with fantastic potential in the future. It’s a good journey time from London – under eight hours direct with the excellent Oman Air – and upon arrival the courses are all in close proximity to the airport, making logistics very easy. The standard of hotels is also superb, with a great range of four and five-star properties. I stayed a little further out of town at the luxurious Shangri La Al Bisson. If you judge hotels by the quality of service and comfort of the beds, as I tend to do, you won’t find many better. Oman is an emerging golfing destination, but before long it will be a leading destination, and I’m excited about following its journey to the top! Fly: Daily flights from Heathrow to Muscat with Oman Air, (omanair.com). Stay: Shangri La Barr Al Jissah Resort & Spa, (shangri-la.com). Play: Almouj Golf, £80 per round (almoujgolf.com), Muscat Hills, £80 per round (muscathillsgolf.com), Ghala Valley, £40 per round, (ghalavalley.com).